After four years of intensive research involving different wavelengths/spectrums, and studying how corals grow and react to them, Orphek has now released their new Atlantik Programmable Pendant. Our testing and research was not just conducted in our own coral labs but in experienced hobbyist’s tanks throughout the world. 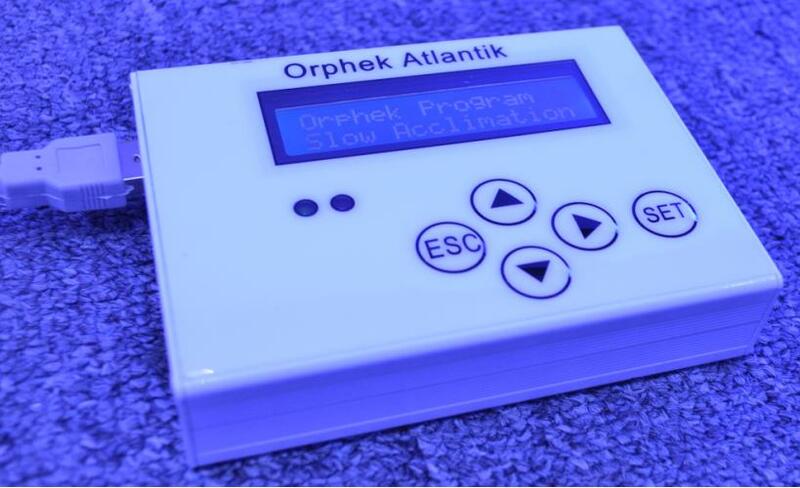 Orphek has accumulated much information about wavelengths and intensity that have shown to be the best growth rate in corals as well as color. Much of this experimentation in our quest to provide the best LED lighting for corals was conducted using our PR156 Pendants as a platform where we could inter-change LEDs of different wavelengths and study the reaction and growth rate the corals displayed. 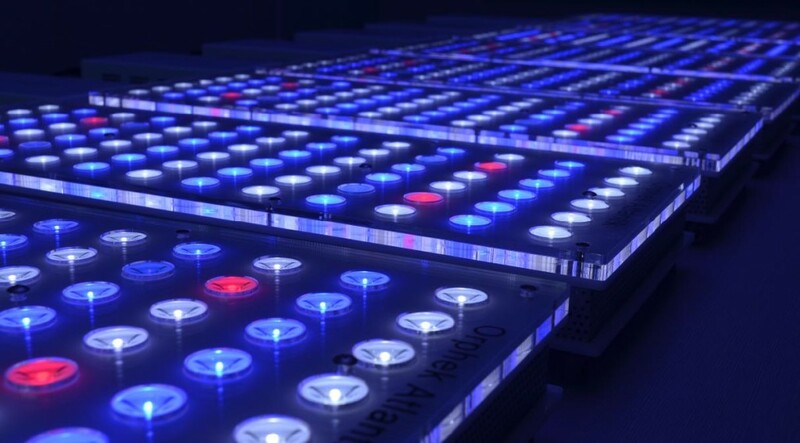 State of the art electronics, whisper quite fans, and excellent interfacing with the Atlantik Controller all contribute to provide the very best LED lighting for your corals. Our four years of research left no stone unturned and the results will speak for themselves. Browse through any marine etailer’s product pages and you will find a plethora of additives and supplements all promising increased coral growth and color enhancement. Of course many of these supplements are necessary and crucial for good coral growth and color, but we need to be aware of the fact that 90% of a corals energy source is generated by the Zooxanthellae that reside in the coral’s tissue. The Zooxanthellae depend on light of the correct intensity and spectrum to grow and flourish. This is why we at Orphek are very dedicated to providing the correct lighting spectrum and intensity necessary for good coral growth and color. We also realize that corals must be acclimated from one light source technology to another while at the same time minimizing loss of Zooxanthellae due to spectrum and intensity changes. Recognizing this fact, we have decided to incorporate eight different pre-installed lighting programs into our Atlantik LED Pendants that can be used for various conditions and/or applications. Some of these programs are very useful and necessary for those with limited experience growing corals using high intensity LED lighting. 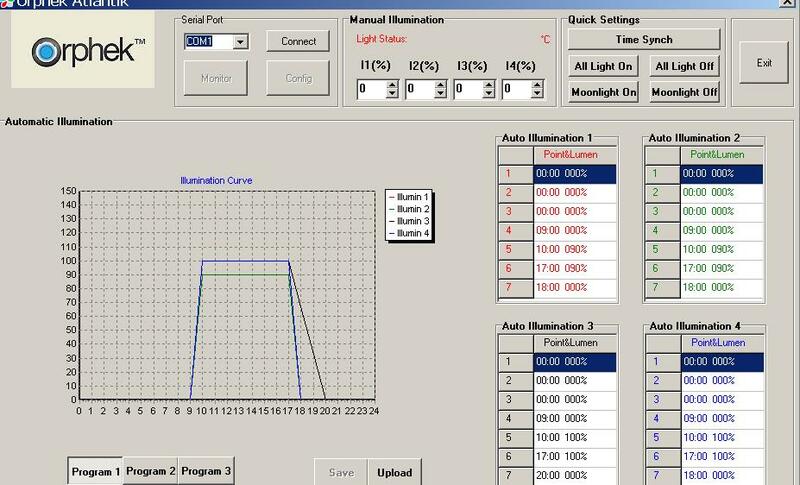 Below is a brief explanation of what each program’s intended use was designed for and the photoperiod functions displayed on the same software that is included with the Atlantik. The correlation between the data boxes under each Illumination channel and the graph are easily interpreted by color matching which makes programming the Atlantik very easy to understand and accomplish. 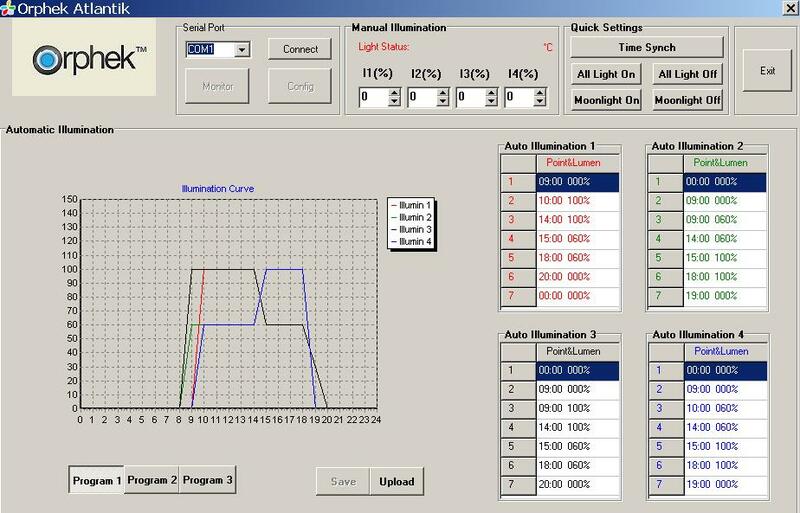 The lighting channels on some programs may follow the same curve so each color may not be visible in the graph. 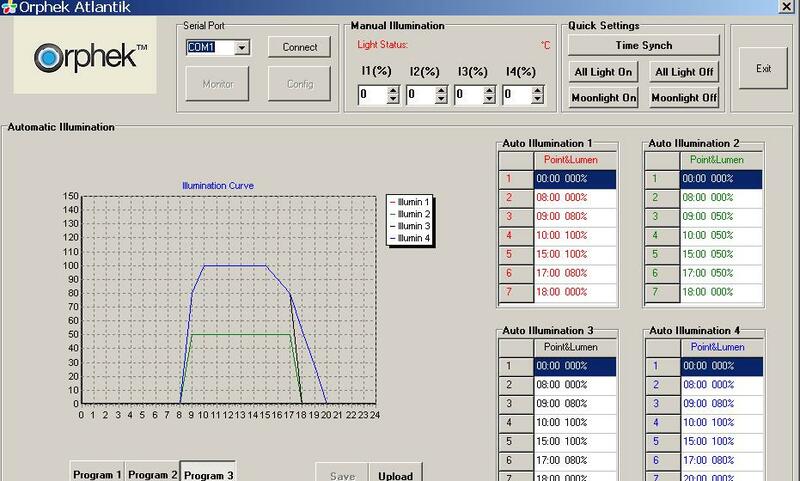 Illumination 1 controls 24 blue 460nm LEDs. Illumination 2 is our brightest channel in the Atlantik featuring 28 high Kelvin white LEDs. 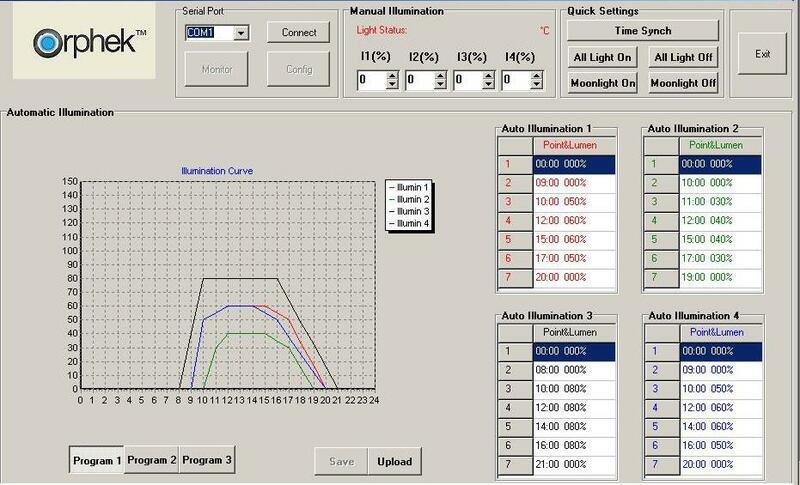 Illumination 3 is useful for night time viewing (moonlight) and also provides additional support to the 460nm blue LEDs used in Illumination 1. This channel provides eight additional 460nm blue and 4 high range UV LEDs to further stimulate coral growth. 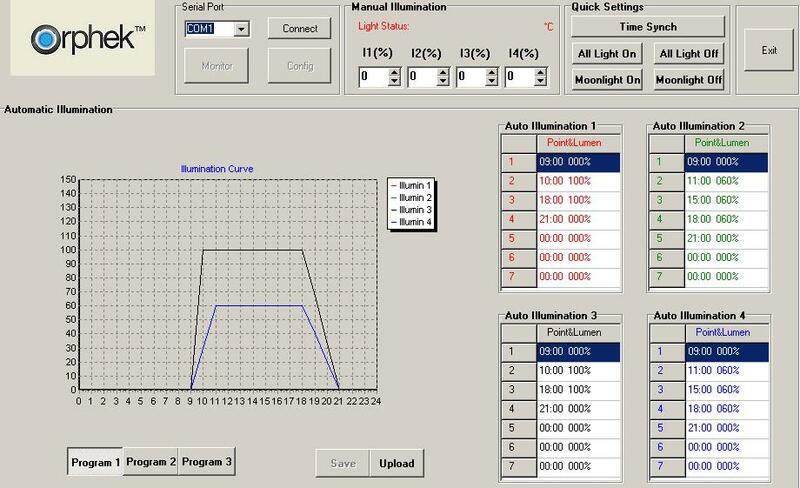 Illumination 4 provides additional support to Illumination 2 by providing 10 white, 17,500 Kelvin LEDs and 4 red LEDs. The red LEDs stimulate Chlorophyll A and B production which is necessary for zooxanthellae growth and health. 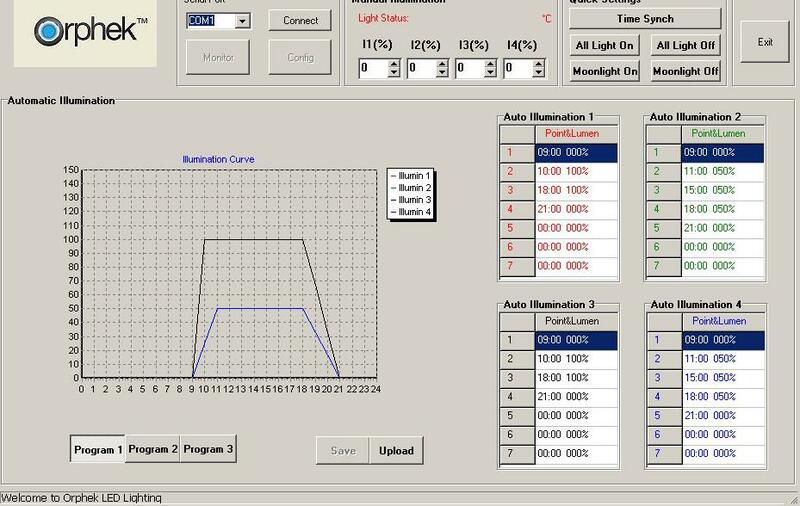 Note: The charts below are shown to depict the photoperiod time and light intensity of all four channels of light on the pre-installed programs. Orphek does not provide software for programming on a PC. Program 1 was designed to be used for coral acclimation to our high intensity Atlantik Pendant LEDs and/or for introducing new corals into your system that may have come from a different lighting technology and/or different lighting spectrum and lower intensity. Program 1 should always be used when first introducing your new Atlantik Pendant to your corals. Program 2 was designed to increase coral growth rate and is typically used when growing frags or immature coral colonies. Illumination 2 provides occassional cloud cast simulation while the remaining channels simulate changes in spectrum intensity throughout the day which is typical on on the reefs. The cloud cast is intended to give the corals a rest throughout the photoperiod. This program was designed to increase coral color while still providing plenty of PAR/PUR for good coral growth. When using this program be sure that magnesium, calcium, and dKH, pH and other parameters are in the ideal range and no negative conditions exist with your corals. Iron, potassium and other beneficial nutrients should also be dosed. This program was designed to be used after Program 2 to maintain accelerated growth and/or to be used with mature colonies. Parameters mentioned in Program 3 will also need to be maintained. Program 5 is designed to improve coral color and maintain coral growth. It provides the best of the Coral Color and Coral Growth programs. Program 6 was designed for shallow coral fragging systems to accelerate coral fragment growth. This is another program where coral growing water parameters must be maintained. If growing a large amount of coral fragments, dKH should be measured daily as the corals will absorb a good amount of carbonates from the water to build their skeleton. Program 7 was designed for retail stores to display their corals giving them a little more irredescence making them more attractive to the buyer while still maintaining the health of the coral. Program 8 is designed to be used with LPS and soft corals that do not require the light intensity required by SPS corals. 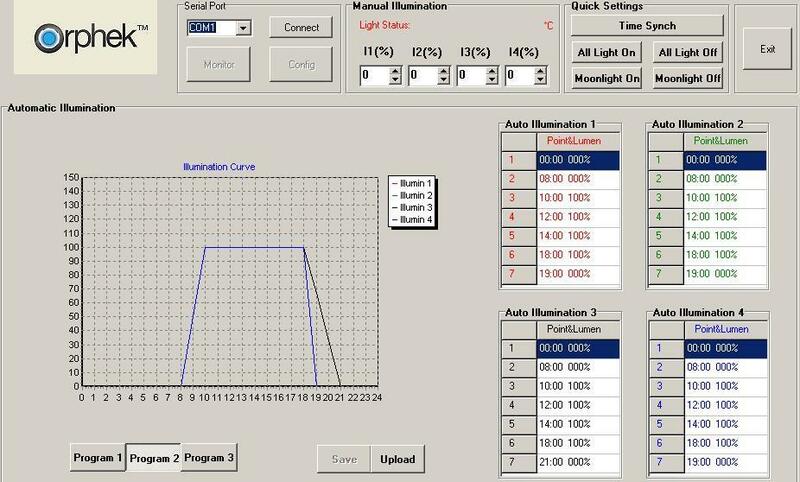 You can also program several of your own photoperiods and adjust intensity of all four channels of light individually. This can be a useful feature in rooms flooded by sunlight or very dark rooms where adjustments in intensity will need to be made. 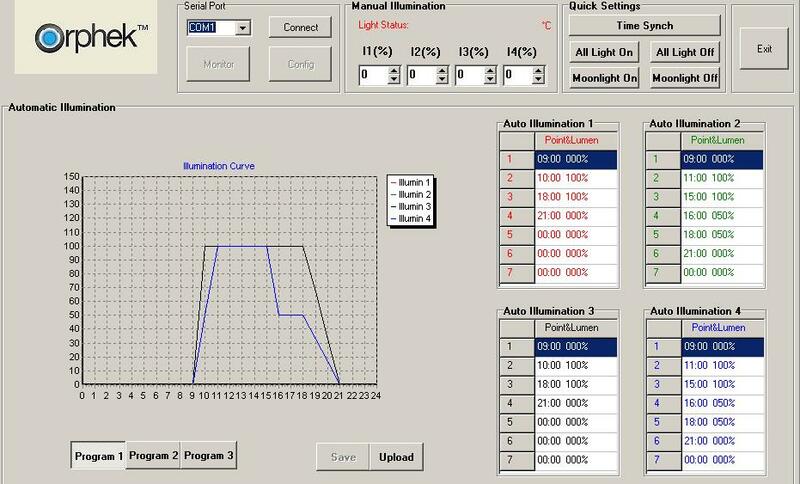 It also allows you to control the lighting based on the types of corals you are keeping.